Hundreds of stories of trailblazing female athletes, accompanied by iconic photos. Perfect for the feminist sports fan in your life. Based on the Instagram account @TheUnsungHeroines, a celebration of the pioneering, forgotten female athletes of the twentieth century that features rarely seen photos and new interviews with past and present game changers including Abby Wambach and Cari Champion. 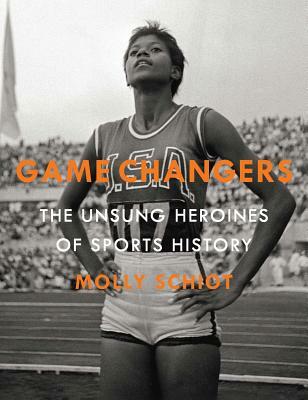 Two years ago, filmmaker Molly Schiot began the Instagram account @TheUnsungHeroines, posting a photo each day of a female athlete who had changed the face of sports around the globe in the pre-Title IX age. These women paved the way for Serena Williams, Carli Lloyd, and Lindsey Vonn, yet few today know who they are. Slowly but surely, the account gained a following, and the result is Game Changers, a beautifully illustrated collection of these trailblazers’ rarely-before-seen photos and stories. Featuring icons Althea Gibson and Wyomia Tyus, complete unknowns Trudy Beck and Conchita Cintron, policymaker Margaret Dunkle, sportswriter Lisa Olson, and many more, Game Changers gives these “founding mothers” the attention and recognition they deserve, and features critical conversations between past and present gamechangers—including former US Women’s National Soccer Team captain Abby Wambach and SportsCenter anchor Cari Champion—about what it means to be a woman on and off the field. Inspiring, empowering, and unforgettable, Game Changers is the perfect gift for anyone who has a love of the game. Molly Schiot is a Los Angeles based filmmaker, who parlayed her dedication to telling women’s stories into the Instagram account, “TheUnsungHeroines.” She is the creator of the “Check You Out” series for Paper Magazine, which has featured comedy duo and Portlandia stars Fred Armisen and Carrie Brownstien, and actress Malin Akerman, and recently directed an ESPN 30 for 30 short, “Our Tough Guy,” about the life of one of the NHL’s most fearsome players, John Wensink. Game Changers is her first book.